Product #22008 | SKU AH-ZED-10FX | 0.0 (no ratings yet) Thanks for your rating! The Allen & Heath ZED-10FX Multi-Purpose Miniature Mixer is a compact yet versatile audio mixer for home recording, small sound reinforcement, video editing and small broadcast/podcast applications. 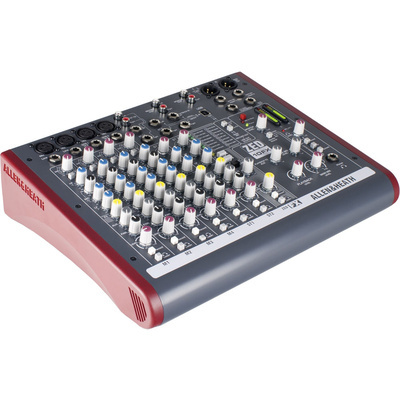 The mixer features 4 XLR microphone inputs, 2 stereo line inputs and 4 Class A FET line inputs capable of accepting instrument and line level audio signals. Class A FET (Field Effect Transistor) inputs deliver the warmth associated with valve tube preamplifiers and a 26dB gain boost switch provides gain needed for instruments with very low output pickups. A powerful 24-Bit effects engine delivers top quality effects ranging from classic reverbs, cascaded delay, shimmering flanger and chorus effects. In addition to all of this, a USB port enables direct connection to a PC or Mac for direct recording and stereo playback with your DAW software of choice.